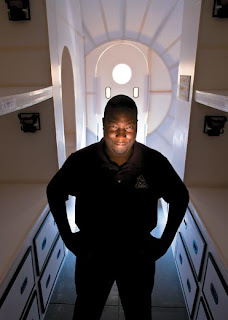 Smithsonian Magazine posted this short article about Robert Howard Jr., a NASA designer working on human habitats for the Moon. Unfortunately, it's unclear from the article whether this cool looking picture is actually one of those habitats. As manager of the "habitability design center" at NASA's Johnson Space Center in Houston, Howard is helping to create a dwelling that could comfortably house four people on the moon for at least half a year. Strangely, the article seems to slowly devolve into a discussion of whether or not manned Moon missions are a good idea. Why must all pop-science articles stray from their topics into these tangential rants? Woops, maybe I'm guilty myself. I think what NASA needs to do is present either a sketch highlighting what they plan on doing, or build a prototype (or at least a mock-model) for Congress to see (regarding lunar habitats that is). If not, Congress may not "catch the vision" of space, and we may find ourselves once again sending C-3PO's and R2D2's to space, instead of a Luke Skywalker (note: yeah, I'm a Star Wars fan).